‘Leung Kit-lam’s eponymous steelware store is…probably the last of its kind in Hong Kong. For decades, he has operated the business alone. 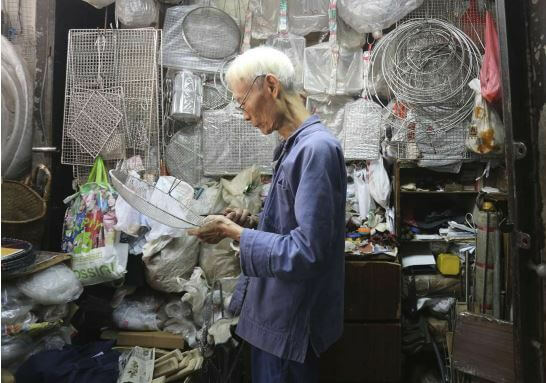 Tucked away in an alley, with a barely visible storefront, Leung works seven days a week making strainers, rat traps and crab pots. “Some neighbouring hotels have bought a few of my rat traps,” he says. The years of hard work have taken their toll on Leung, who no longer has much flexibility in his fingers. Still, it hasn’t deterred the 87-year-old, who embodies the tenacious work ethic of Hong Kong’s older generation. Leung’s handmade strainers are more expensive than the mass-produced versions but are sturdier and more durable, earning him many loyal customers, especially cooks from nearby noodle shops.